Slate is well-known as a fine-grained, homogeneous, and metamorphic rock that is derived from a sedimentary rock named shale through a natural phenomenon, which takes place under the earth's crust. The slate-stone consists of minerals like quartz, mica, hematite, chlorite, and various other. Although the color of this rock varies from the darker to lighter hues of black and gray, they may be of red or purple color, depending on their mineral quantity. The internal heat of the earth modifies some part of the clay that is present in shale (the sedimentary rock) into minerals like chlorite and mica. Slate is formed as a result of the pressure exerted on mica by the natural movement of earth's crust, which compresses the mica and numerous other minerals into parallel layers. 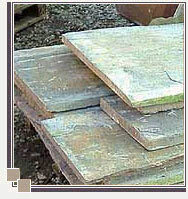 Chemically, the slate-stone is a multi-mineral, formed from several minerals and colloidal substances collectively. The necessary mineral composition of a slate-stone consists of members of mica group and clay group. The mica group includes sericite and muscovite. Among these, sericite is an alteration mineral of plagioclase feldspars and muscovite is a phyllosilicate mineral of potassium and aluminum. The second group, i.e., clay group consists of paragonite, kaonilite, and chlorite. Oxides, quartz, feldspar, calcites, and little amount of ferro-magnesium constitutes the accessory minerals. It is fairly resistant to acids and staining.